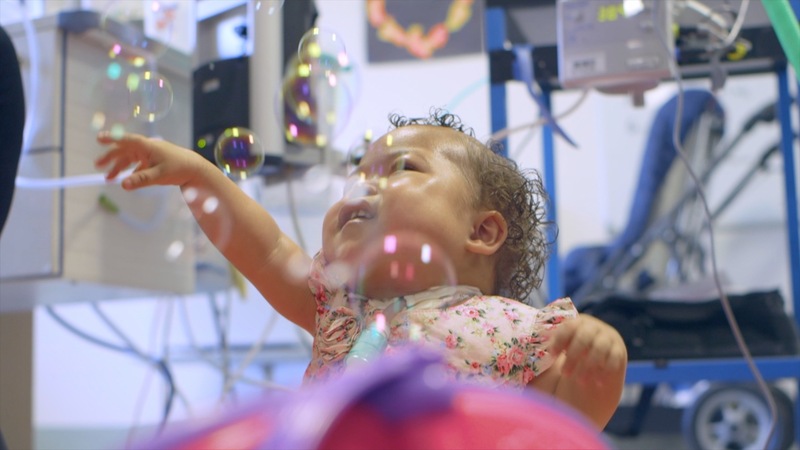 We set out to capture 24 hours at Great Ormond Street Hospital (GOSH) by working with families, patients and staff members to film their experiences. Our ambition was to capture the stories, challenges and triumphs on any given day and throughout the night at GOSH. We wanted to share these with our audience, reflecting both the sensitive and difficult times as well as the happier moments. The overarching campaign aim was to raise awareness of Great Ormond Street Hospital Children’s Charity’s contribution to the hospital, and to reach supporters and new audiences on our digital platforms. We chose the concept of ‘one day’ to capture the extraordinary things that happen every day at GOSH and bring our digital audience closer to the charity and to the hospital through filming a 24-hour period at GOSH. Children sometimes spend weeks or months at GOSH, so by focusing on a 24-hour period, we hoped to make it easier for our audience to relate to their experiences with a compact and tangible timeframe. The 24-hour message was therefore central to the campaign, and we wanted this to be an authentic capture, which also meant being flexible and sensitive to the reality of filming in a busy working hospital. Our in-house team filmed on location at the hospital and captured pre-scheduled appointments and surgeries as well as the everyday, behind-the-scenes moments that happen across the hospital. GOSH cares for children 24 hours a day and we felt showing life at GOSH from sunrise to sunset and through the night was an appropriate and emotive way of sharing a snapshot of the hospital’s outstanding care. At the heart of the campaign is a short film that portrays the 24-hour period we filmed, with no dialogue or ‘talking heads’. This was a way to showcase the breadth of care and activity at the hospital while also creating an emotional connection. However, we also wanted to share details from the stories of families and staff we featured. We used a long form digital storytelling device through a ‘Shorthand’ platform integrated into our Drupal website. This enabled us to share the emotive stories in their entirety without requiring our audience to flick between pages, disrupting the core campaign message. Here we shared the stories of patients, Phoebe and Freddie, who appeared in the film, as well as consultant plastic and reconstructive surgeon, Mr Neil Bulstrode. To bring the campaign to life for our audience, we matched the 24 hours at GOSH to 24 hours in our audience’s lives. We launched the campaign by tweeting every hour over 24 hours with the hashtag #OneDayatGOSH, including everything from lunchtime in the hospital restaurant to a mother giving her daughter a bottle before bedtime. We wanted people to stop and think about what they were doing in that moment, to consider the experiences of families and staff at GOSH too. The charity has a new digital strategy, which focuses on putting the stories of patients, families and staff at the heart of our communications and this campaign really encapsulated this approach as it featured content and storytelling at its heart. With so many ‘firsts’ for the digital team and the charity with this campaign, we have learnt a lot. One of the biggest insights is, unsurprisingly, that excellent content speaks for itself and the stories of patients, families and staff at GOSH makes for a truly powerful campaign. It was very helpful to have this reaffirmed throughout the project as this was still a new way for us to work with families and staff in the hospital. We have also learnt that our audience are tuned into emotive stories and that this approach inspires them to share their own experiences of GOSH too. Another significant learning for our team is that sharing in-depth stories can be just as impactful, if not more so, than bite size content. However, it needs to be created with the audience in mind, tailored to the relevant digital platform, and with a clear message running throughout. We knew we had an engaged supporter base on digital channels. Many of our supporters are parents of current or former patients, or were themselves treated at the hospital. What was particularly fantastic for us was the number of people who interacted with the campaign by sharing the content with their own friends and networks on social, and by sharing their own experiences of being at GOSH with us too. The sheer number of stories shared with us on our social channels was an unexpected but very welcome highlight of the campaign. It was interesting for us to see how this film, created with raw footage, powerful imagery, and emotive stories, really captured our supporters’ imaginations. The film was viewed more than 473,000 times and the campaign reached over six million people across all platforms. Another great result was that our Facebook audience grew by around 6,000 in the week the campaign ran, which is brilliant in terms of building a more engaged digital community going forward. We’re encouraged that this bold and creative campaign was so well received by our audiences. We’ll be exploring how we can develop even more engaging, family and patient-lead campaigns in the future and considering how to add in impactful fundraising messages too. Yasmin is head of digital engagement at Great Ormond Street Hospital (GOSH) Charity, which raises money to help the hospital treat seriously ill children from across the UK and supports their families too. Yasmin oversees the charity’s digital strategy and campaigns, and supports her team to bring the incredible stories of GOSH patients, families and staff to life across their digital channels and activity. She also oversees the hospital’s digital channels. Yasmin has 11 years experience in not-for-profit organisations, and has previously worked for the Youth Sport Trust, Cafédirect and Islamic Relief Worldwide.